﻿ Why Are Students Of All The Campuses of TISS Up In Arms ? Why Are Students Of All The Campuses of TISS Up In Arms? 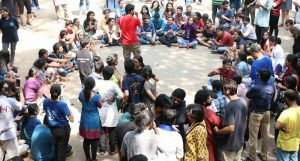 Protests at Tata Institute of Social Sciences entered its third day on Friday with students demanding the continuation of financial aid to SC, ST which has been scrapped from this academic year. TISS Students’ Union called for a strike after the administration withdrew financial aid given to students from SC/ST category across all its campuses under the Government of India – Post Matriculation Scholarship scheme. Financial aid had already been withdrawn for OBC students in 2015. Additionally, the varsity has been constantly hiking fees, due to which many students have been forced to drop out or never apply to the institute. In May 2017, the institute had issued a circular revoking the scholarship affecting close to 1,200 students, The Hindu reported. On Wednesday, around 100 students held a dharna at the entrance gate and a majority of classes was boycotted. The protest spread to the institute’s other campuses in Hyderabad, Tuljapur and Guwahati on Thursday. On Thursday, the administration agreed to exempt SC/ST students of the 2016-18 batch from paying hostel and dining hall fees. While pointing out that the aid was mentioned on the prospectus of the 2017-19 batch, he said that it was withdrawn at the time of admission. He further demanded that a provision be made for those students who can’t afford to pay the full fees. The plan to launch protests came after dialogue between the students’ union and the administration failed, according to a statement by student’s union.